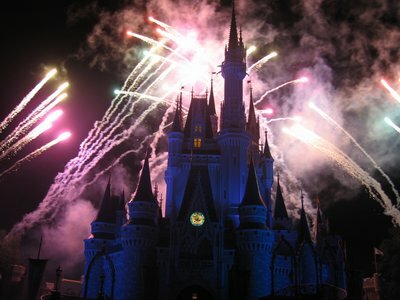 Certainly one thing that makes a trip to Disney World so special is watching the Wishes fireworks show in The Magic Kingdom. You have probably seen the show or are planning on watching the show from Main Street U.S.A or at various locations throughout the Theme Park. But, did you know that there are a few other great places where you can watch the show? Here is a list of places you may want to watch from! 1. California Grill- If you get a reservation to this restaurant located on the 15th floor of the Contemporary Resort you can watch the fireworks with music included from their observation deck! The music also plays throughout the restaurant so you can stay indoors if you choose. If you have an early reservation, keep your receipt and head back up for a night cap and the fireworks! 2. Polynesian Beach- Pull up a pile of sand and grab a tropical drink and enjoy the fireworks complete with music from the sultry Polynesian Beach. This is one of my favorite places to see the show. It is like being in a tropical paradise and not much tops it! 3. O’hana- Also located at the Polynesian Resort is O’hana. Grab a reservation here (You may need to make it months in advance) and the music is piped in and the show is visible from the restaurant! 4. Transportation and Ticket Center- This may not have the romance of the Polynesian or the location of the California Grill, but if you head to the TTC before the show you will not only get a great view of the fireworks, but you will also beat the crowds to the parking lots! 5. Narcoossee’s- Located at the Grand Floridian, this restaurant is also a lovely place to see the fireworks. If you can get a table about 30 minutes or so prior to the start of wishes you should have decent view. You can also go outside and stand along the rail to watch. Have you ever seen Wishes from outside the park? Where do you think is a good place to watch? This entry was posted in Planning Tips, Top Five and tagged California Grill, contemporary resort, o'hana, polynesian, wishes. Bookmark the permalink.